With the aid of modern tools and sophisticated technologies, we have been able to manufacture, supply and export Shopping Trolley . Guarantees high safety, these trolleys are manufactured using high-grade raw material like steel and basic components that are sourced from the accredited vendors of the industry. High load bearing capacity, low maintenance. Shopping Trolley with Baby Seater. Our company has created a niche in the field of offering Stainless Steel Shopping Trolley. 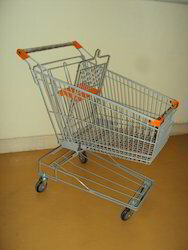 Supermarket trolleys are available in sizes of 60 ltrs & 125 ltrs. They are ideal for supermarkets and shopping centres. In order to keep pace with never ending demands of the customers, our company is instrumental in presenting excellent quality assortment of Supermarket Shopping Trolley. 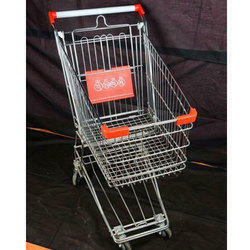 As per the needs and requirements of our clients, we are involved in providing Shopping Trolley.